There was a rich merchant who longed for a son. He prayed to Shiva who blessed him with a son but said that he Would live only for twelve years. The merchant started praying and fasting with more devotion . When his son was eleven years old, he sent him to Kashii for spiritual education. On the way, the boy stopped at the capital where the princess was getting married. The groom's father wanted to hide the fact that his son was one-eyed and asked the merchant's son to pose as the groom. After the wedding, the merchant's son wrote the truth on a scarf. He gave it to the princess and went to Kashi. When the princess read the scarf, she refused to accept the one-eyed groom and waited for the merchant's son. When the merchant's son completed twelve years, he died. 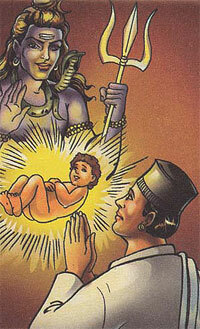 But Shiva was pleased with the merchant's devotion and brought his son back to life. His son returned bringing the princes as his wife.